When your program's motto is ''row the boat,'' you can't be too preoccupied with where it will end up. Focus on the process and the results will follow. That's how Western Michigan is reacting to a pair of head-turning victories over Big Ten schools. The Broncos and coach P.J. Fleck have made quite an impression to start this season, beating Northwestern and Illinois on the road and living up – so far – to their billing as favorites in the Mid-American Conference. The 35-year-old Fleck still talks with the same kind of energy he showed when he took over the job before the 2013 season. Only now, WMU is having so much success that a more even-keeled approach is sometimes required. Before this season, Fleck tried to keep expectations under control, scoffing at the idea that his team was favored in the MAC. The hype has only grown since then. The Broncos opened the season with a 22-21 win at Northwestern. After routing North Carolina Central, they went on the road again and thumped Illinois 34-10. Now WMU can start dreaming about a truly special season. Those victories raised the stakes. Western Michigan went 1-11 in Fleck's first season, and offensive lineman Taylor Moton recalls a bit of upheaval after the new coach arrived. ''There was a divide,'' Moton said. New coaches often face challenging transitions, and it took some time for Fleck to put together a roster talented enough to compete. Immediately after that season, Fleck signed a recruiting class in 2014 that was ranked by Scout.com as the best in the MAC. Since then, the Broncos haven't looked back, on the field or the recruiting trail. They went 8-5 each of the past two seasons, winning the Bahamas Bowl last year for the first bowl victory in school history. ''Row the boat'' has become an ideal mantra for a team like WMU – quirky enough to draw attention to an under-the-radar school and unusual enough to give the program an identity that players, coaches and fans can rally around. It helps that Fleck is such an effective messenger. Fleck wants the program's motto to apply on and off the field, and the phrase obviously resonates more when the Broncos are winning. WMU converted four times on fourth down in the victory over Northwestern. Morale was already high coming into the season for the Broncos, but that win was a nice early sign of what was possible. After sweeping the two Big Ten teams in the state of Illinois, the Broncos still have to prove they can measure up against the MAC's lone football team from that state. That would be Northern Illinois, which has played in the MAC title game six straight seasons and stands in WMU's way in the West Division. The Broncos host Northern Illinois on Oct. 8 – and there are challenges even before that game. 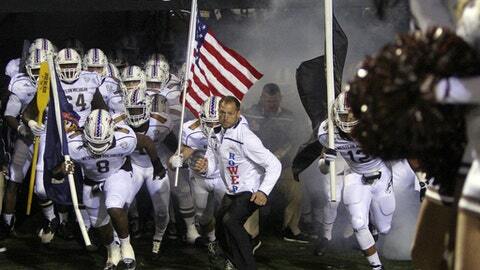 On Oct. 1, WMU plays at Central Michigan, which upset Oklahoma State. And this weekend, the Broncos host a Georgia Southern team that beat them 43-17 last year. In other words, now is not the time to take a break from rowing. Not even for a moment.